After announcing the new album The Unheavenly Creatures last week, Coheed and Cambria have announced plans to bring the album to Canada on tour. The September trek dubbed the "Unheavenly Tour" marks the band's first full headline tour in the country in eight years. Coheed and Cambria will be joined by fellow prog-minded outfit Protest the Hero and Ontario psych-blues duo Crown Lands. The Canadian run will find the three-band bill making stops in Vancouver, Edmonton, Calgary, Saskatoon, Winnipeg, Toronto, Montreal and Quebec City. Tickets for all dates go on sale to the general public on Friday (June 29) at 10 a.m. local time, while a pre-sale begins tomorrow (June 27) at 10 a.m. local time. Further ticketing information can be found through Coheed and Cambria's official website. 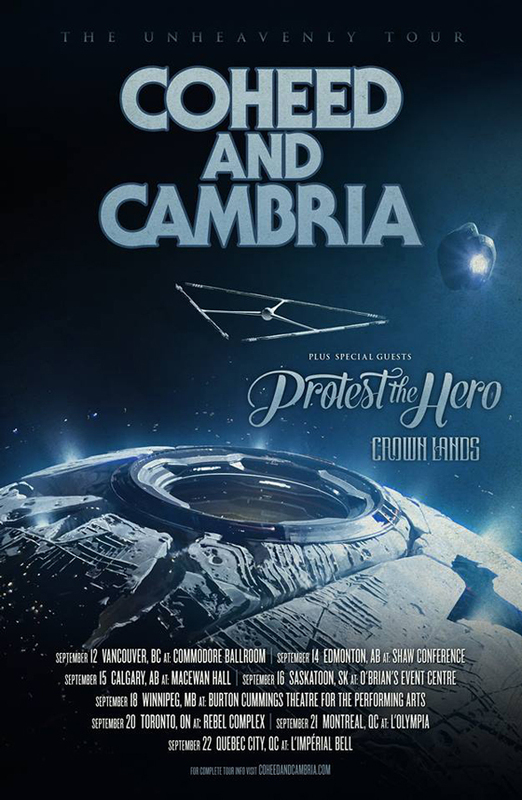 Following the Canadian run, Coheed and Cambria will then cross the pond for a series of dates in the UK. You can find a complete tour itinerary below.